Well, I've had the good fortune (the harder I work the luckier I get?) 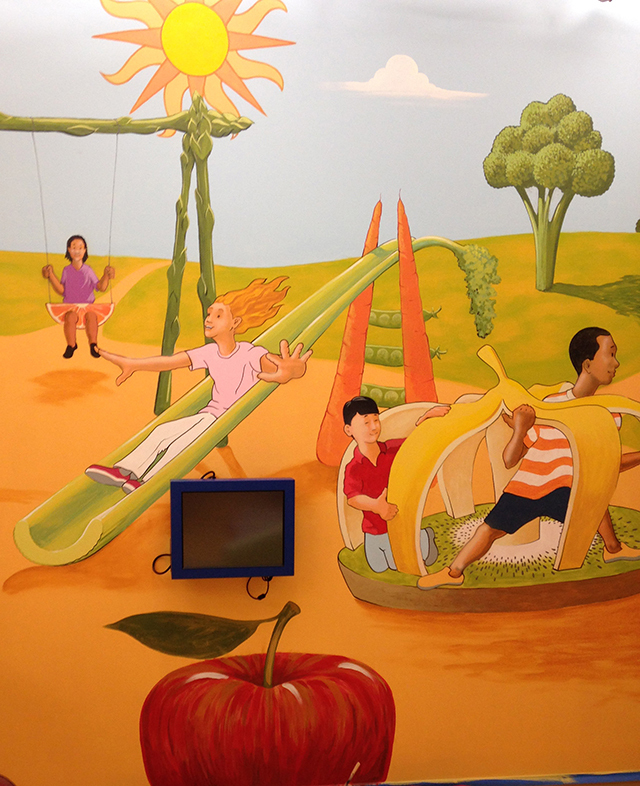 to complete yet another project at Children's National Medical Center. What's really nice about working there is that I have the opportunity to work with so many new and great individuals. Initially I met with Dr. Cogen, the head doctor, and Kathleen Coppedge who is the Clinical Operations Supervisor at CNMC's Washington Nationals Diabetes Care Complex (yep, our Nats help to make the complex a reality!). Dr. Cogen and Kathleen voiced a desire for something bright, cheerful and energetic that encouraged exercise, healthy nutrition and good medical care. They, I think, were a little disappointed that I didn't just pull a design out of my hat ready for their approval! Unfortunately, for me, most of the time I need to let things brew. Truthfully, it's not really that I am thinking up great designs, ideas come and go at random times. Then I put pencil to paper and, somewhat out of nowhere, a design formulates! It's actually pretty cool and I never know where it comes from! So, the end product is a FRUIT & VEGGIE playground. The addition of a doctor ( looking a little like Dr. Cogen ) helping a child serves to express the medical element without being overbearing.